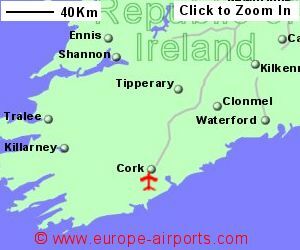 There is a regular bus service between the airport and Cork costing approximately 4 Euros. Cork bus station is a 10 minute walk from the train station on the national network. The taxi fare into central Cork ir the train station is around 20 Euros. Within the terminal building which opened in 2006 at Cork airport are 6 cafe/restaurants, 2 shops, bank, a hair stylist, currency exchange, 2 ATMs, executive lounge, Internet kiosks and FREE WiFi Internet access. 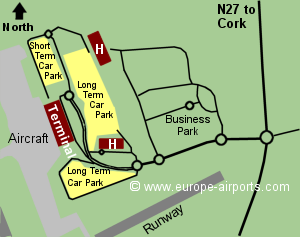 The Cork International Hotel and the Cork Airport Hotel are located close to the airport terminal. 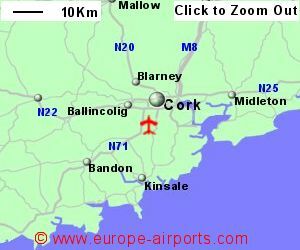 Cork airport has Airport Carbon Accreditation, at the Reduction level. 2.3 million passengers passed through Cork airport in 2017, an increase of 3% from the previous year but still well below the airports record of 3.3 million in 2008.